Athletes walk down the beach toward the water for the start of the 2016 Ironman 70.3 Ohio at Delaware State Park. 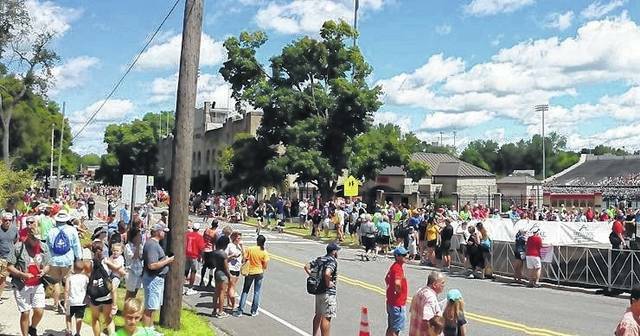 Crowds gathered for the inaugural Ironman triathalon in 2016. The event returns for its second year on July 30. • Dino Weekend at the Columbus Zoo & Aquarium, 4850 Powell Road, Powell, 9 a.m. to 7 p.m. Saturday & Sunday. The zoo will honor the return of Dinosaur Island this weekend. The zoo will feature characters from The Flinstones cartoon and a paleontology station presented by The Ohio State University. For information, visit www.columbuszoo.org. • Chess, Powell Branch library, 460 Liberty St., 2 to 4 p.m., Sunday. The Delaware County District Library invites all ages to join in a relaxed chess playing atmosphere, meet new players and talk about moves. • Harmony in the Parks, Bicentennial Park, Washington Street & Park Avenue, Delaware, 7 to 8 p.m. Sunday. Ain’t Misbehaving will perform in this summer concert series organized by the Delaware Community Center YMCA, 1121 S. Houk Road, which will host the concert in case of rain. Concert goers are encouraged to bring lawn chairs since seating is limited. The Emoji Movie (PG): 2 p.m., 5 p.m., 8 p.m.
Dunkirk (PG-13): 2:15 p.m., 5:15 p.m., 8:15 p.m.
Atomic Blonde (R): 2:30 p.m., 5:30 p.m., 8:30 p.m. The Emoji Movie (PG): 1 p.m., 4 p.m., 7 p.m.
Dunkirk (PG-13): 1:15 p.m., 4:15 p.m., 7:15 p.m.
Atomic Blonde (R): 1:30 p.m., 4:30 p.m., 7:30 p.m. The city of Delaware is counting the down the days for the second year of Ironman 70.3 Ohio. The signs are up to welcome athletes and their families and to warn residents of traffic delays on Sunday. More than 2,500 athletes are expected to swim 1.2 miles, ride a bicycle for 56 miles and run 13.1 miles in succession over the course of eight hours. “It seems to me everything is more relaxed this year,” said Mayor Carolyn Kay Riggle. She said 95 percent of athletes approved of the event last year based on feedback from race coordinators. Riggle said it was rewarding last year to see a woman nearly 80 years old compete. “It was just compliment after compliment,” Riggle said. 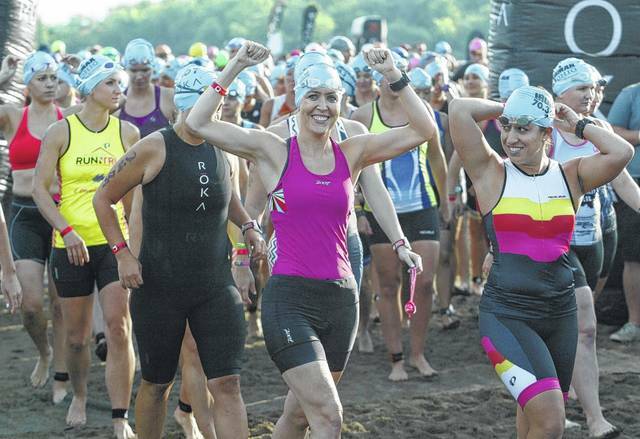 As of Monday, 1,100 people and 27 nonprofit groups had volunteered to assist with Ironman, including boy scout troops, churches and sporting organizations, said Michele Kohler, a co-volunteer director. The nonprofit groups hope to meet their volunteer quotas to earn a share of $18,000 in grant funding. “We have great people who want to volunteer in this community,” she said. Due to limited lodging options in the city, the Ironman’s economic development impact will expand to the central Ohio region, Riggle said. That’s because a majority of athletes will book hotels in Columbus and other parts of Delaware County. The inaugural event took place in August 2016 when it was move-in day for Ohio Wesleyan University students. It was moved up to July to help improve parking and lodging accommodations for some athletes. “We’re providing a handful of rooms this year and want to work with Ironman organizers to expand OWU housing options next year and in the future,” OWU spokesman Cole Hatcher said. But Riggle said the triathlon showcases Delaware and could encourage visitors to return again. “It’s good for Delaware to have this kind of event,” she said. In addition, Ironman will have a fun run at Selby Stadium on Saturday. Registration will start at 8:30 a.m. on South Henry Street with the run to start at 9 a.m.
OhioHealth will sponsor the event again this year. It will provide on-site medical care for athletes on the day of the event. “We at OhioHealth, and specifically OhioHealth Grady Memorial Hospital, are very excited about Ironman 70.3 Ohio this weekend. As the presenting sponsor again in 2017, continuing our commitment of being a dedicated member of this great community, we know a successful event for the city of Delaware and Delaware County is a win for everyone involved. Ironman 70.3 Ohio in 2016 was a great start to this sponsorship for OhioHealth,” said Steve Bunyard, president of OhioHealth Grady Memorial Hospital. “Improving the health of those we serve is not only something we live every single day for those in Delaware and the surrounding communities, but it’s also true for those athletes and their families from around the country and world, who might be in our community for only a few days,” he said. Ironman is a Wanda Sports Holdings company. Since the brand’s inception in 1978, the Ironman has grown from a single race to more than 260 events across 44 countries. https://www.delgazette.com/wp-content/uploads/sites/40/2017/07/web1_start.jpgAthletes walk down the beach toward the water for the start of the 2016 Ironman 70.3 Ohio at Delaware State Park. https://www.delgazette.com/wp-content/uploads/sites/40/2017/07/web1_14067778_10153538299356653_1958465743810451542_o-1-.jpgCrowds gathered for the inaugural Ironman triathalon in 2016. The event returns for its second year on July 30.